On February 24 and 25 Yorkville will be transformed into a lustrous winter fairyland. Bloor-Yorkville’s 13th Annual Icefest is a free event providing entertainment and exciting activities for all ages. 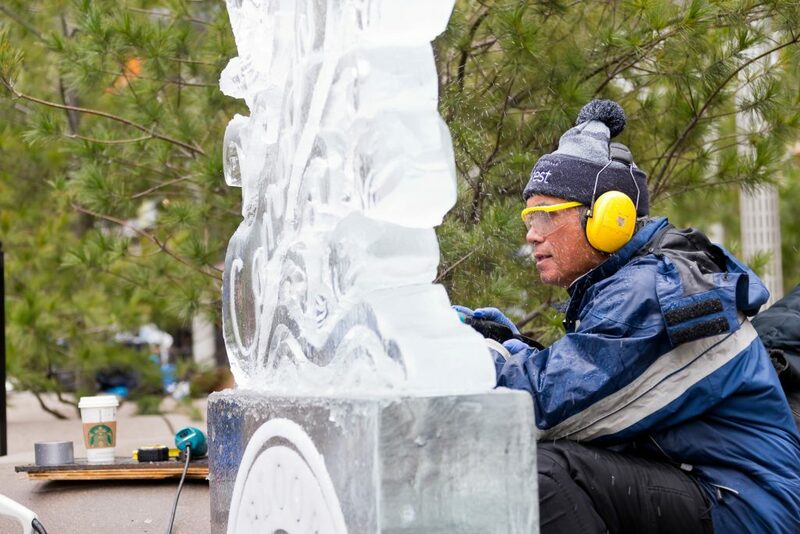 The Sassafraz Ice Carving Competition will take place in the Village of Yorkville Park; where you’ll see blocks of ice undergo a magical transformation. Creative carvers will chisel, chip and hack away to create alluring ice sculptures. Bloor-Yorkville invites you to stroll through the neighbourhood and admire awe-inspiring masterpieces in this year’s ‘Medieval Times’ Ice Exhibition. An array of skillfully carved ice designs will surely captivate the eyes. 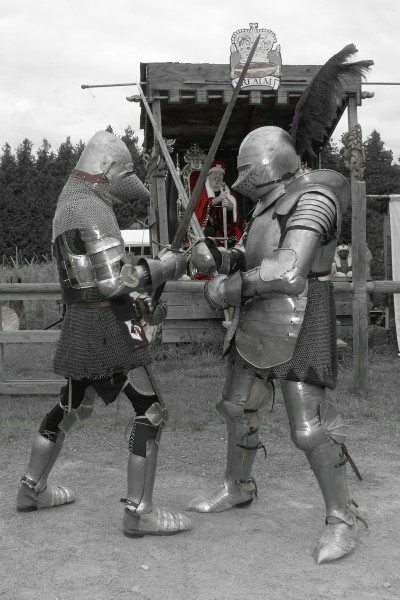 To highlight the central ‘Medieval Times Theme’ the event will showcase Blades of Glory – Knight Tournament Show, two knights will compete in a riveting Dual of Arms before an exhilarated audience. After enjoying a fun filled day visitors can unwind in the ‘Icefest Lounge’. 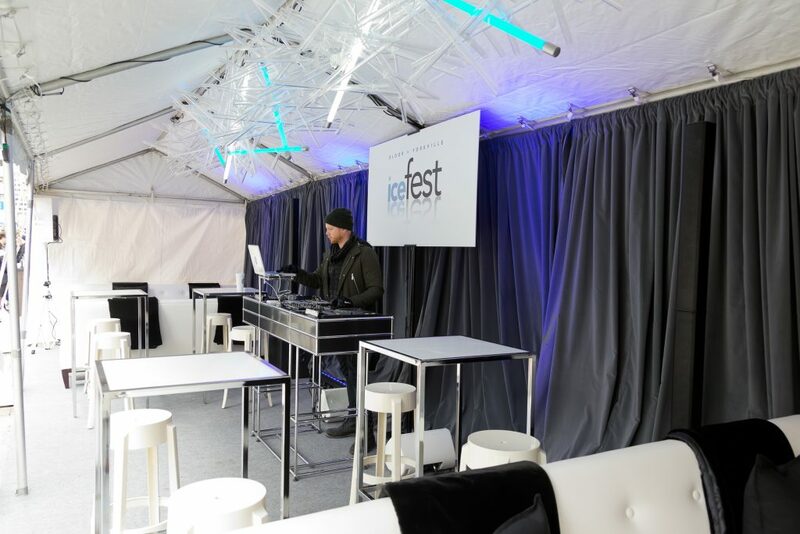 Last Year’s Icefest Lounge – before the crowd! The festival provides a platform for artists to demonstrates the skill, talent and creative flair needed to produce exquisite ice sculptures. 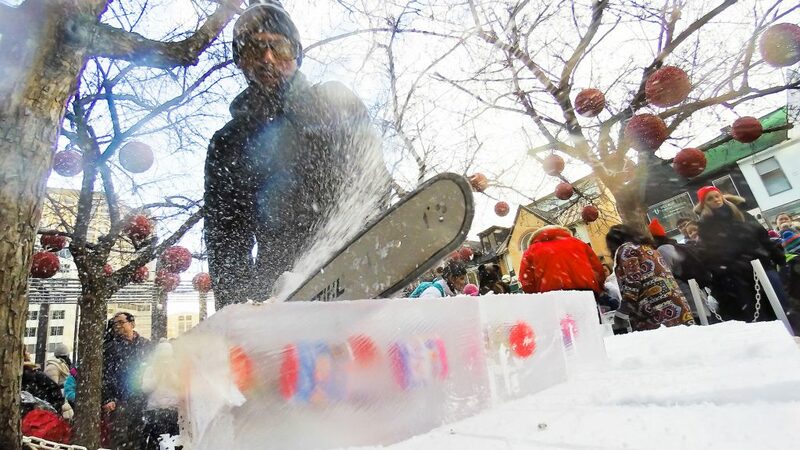 When Icefest was launched in 2006, the event drew 2,000 people. Last year’s festival attracted over 40,000 attendees along with local media including CBC News, Global News, CityNews and CP24. Bloor-Yorkville continues to raise funds for the Heart and Stroke Foundation in recognition of Heart Month in February. “The event started as a small ice carving competition by Sassafraz. The Bloor-Yorkville BIA took it on and developed it into what it is today,” said Rick Kaczmarek, Director of Marketing at the Bloor-Yorkville BIA. The festival is a great opportunity for the business community to engage and build partnerships. Icefest’s Gold Sponsors are Holt Renfrew, The Hudson Bay Centre, and TD Bank Group. The Colonnade and the Manulife Centre are Silver Sponsors while Yorkville Village, Sassafraz, Roots and Game & Hobby Zone serve as the Bronze Sponsors. Our print media partner is the Toronto Star and we are pleased to announce that Indie88 will be on site as our official radio partner. Several Yorkville retailers provided prizes for the Icefest Indie88 Superfriends Contest, where they’ll receive advertising and promotions courtesy of Indie88. The Bloor-Yorkville BIA Members and sponsors have been generous partners by donating to the Icefest Price Package Draw, sponsoring Competition Sculptures or 3 and 5 – Block Exhibition Sculptures. Each block is estimated to weigh about 300 lbs. Spectators will have their say by voting for their favourite ice sculpture, at the Sassafraz Ice Carving Competition, and they will automatically enter the Bloor-Yorkville Prize Package Draw. The contest is part of the ‘People’s Choice Sculpture’ award and typically receives over 600 entries. The draw takes place at approximately 5:15 pm on Saturday, February 24 and the ice carving competition winners will also be announced then. For a small donation people can make snow candy at the ‘Maple Syrup Taffy Station’ or purchase an ‘Ice Kiddie Cubes’ with a surprise toy inside. All proceeds are in support of the Heart & Stroke Foundation of Ontario. Ice Kiddie Cubes are cut into squares with a surprise toy inside! The Bloor-Yorkville BIA continues to work with an array of talented artists to build on a tradition of creating amazing ice sculptures for all to enjoy. We look forward to seeing you at Icefest.